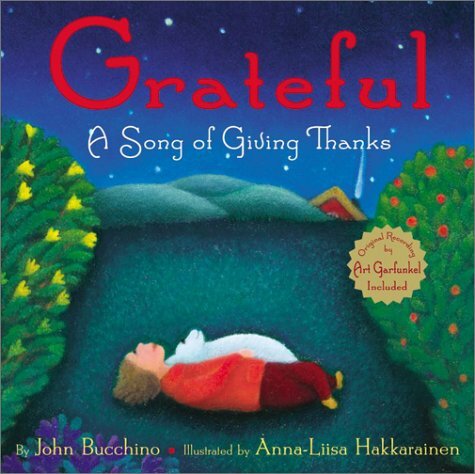 John's most popular song, GRATEFUL, has been made into a children's book by Julie Andrews and her daughter, Emma Walton. It's called "GRATEFUL, A Song Of Giving Thanks" is published by Harper Collins, and consists of the song's lyric gorgeously illustrated by renowned Finnish artist Anna-Liisa Hakkarainen. Also included with the book are simplified sheet music and a CD of a brand new recording of the song by Art Garfunkel with a glorious orchestral arrangement by the legendary Don Sebesky (featuring John on piano.) It's a perfect Thanksgiving gift, "Thank You" gift, Holiday gift, or anytime gift for a child or grownup. Winner of the Parents' Choice Gold Award! heard the song at a Thanksgiving dinner. This beautiful book is one more big step in bringing the song and its sentiment to a wider audience. I couldn't be more pleased with it!" Says SOOOOO much in relatively so few words..... This book really says in a very few words all we need to know about living a full, rich, peaceful, serene life. The illustrations actually filled my heart with those same feelings, eliciting quite a response physically and heartfully. Add the included CD and it is no longer a question, adding this book to your library is a necessity. In fact, it would make a good coffee table book..... The simple text acknowledges that the world is not perfect... it is blemished, and it is up to us to choose whether to "moan or sing" and whether to "count sheep or our blessings". This will be one I will collect several copies to give away and keep around my house. I recently got to see and hear the story about this wonderful book from the author. He sang the song and accompanied himself on the piano, it was thrilling to hear the depth of feeling in this beautiful song. This book should be a holiday classic and be treated as a gift to all who read and hear it. The illustrations are beautiful and can be enjoyed by all ages. *PLEASE NOTE: THIS LINK WILL TAKE YOU TO THE CHILDREN'S BOOK PURCHASE PAGE. IS MISTAKENLY LABELED "BUY CD" - YOU WILL RECEIVE A CHILDREN'S BOOK. THANK YOU FOR YOUR UNDERSTANDING.